Explore the vibrancy of the Pink city and marvel at the history. One of the top travel destinations in Rajasthan, Jaipur is a kaleidoscope of people, landscape and architectural grandeur. A Jaipur India Travel is irresistible to almost every type of tourist. Situated 15km south of the city-center, Jaipur's Sanganer airport is served by domestic Indian Airlines and Jet Airways flights from Delhi and Mumbai. 1 km west of the city is the railway station which is in close proximity to the main concentration of hotels in the city. State buses from all over the state and further afield converge on the central Inter-state Bus Terminal on Station Road. Air : Jaipur city is directly connected to Delhi, Bombay, Jodhpur, Udaipur, and Ahmedabad through regular flights. All major domestic airlines have their services to Jaipur. Rail : Jaipur is also well connected by trains. The Pink City Express leaves Delhi at 6 am and reaches Jaipur at 11 am. Chetak Express and few other Jaipur-Delhi trains leave from the Old Delhi Railway Station in Delhi. However, if one has money and leisure, there is no better option than the Palace-on-Wheels, which leaves Delhi every Saturday. Bus : There are also good bus services from Delhi and other important north Indian cities to Jaipur. Deluxe buses from Jaipur to Delhi take five hours. Hawa Mahal : Hawa Mahal was built by the Maharaja Sawai Singh in 1799. The Hawa is an integral part of the city palace. It is a fascinating landmark of Jaipur. The Hawa Mahal is a fine five-storied building with pyramid shaped structure. 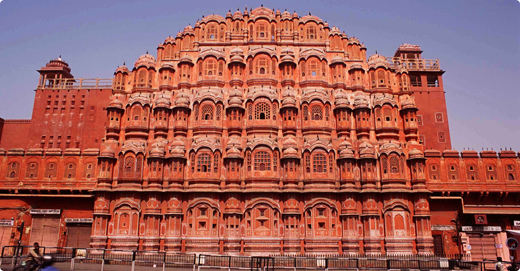 The Hawa Mahal has tier after tier of 953 fine and small casements. The main entrance to the Hawa Mahal is through the safety door that opens into the spacious courtyard. One can view the wonderful sunlight view in the early dawn that comes through the lattice windows of the Hawa Mahal. This landmark has been a center of attraction to the tourist, since time immortal. The City Palace : Travel to Jaipur to witness the City Palace, which is a fascinating landmark. The Hawa Mahal reflects the imposing blend of masterpiece of Rajasthan architecture. Maharaja Sawai Jai Singh built this fascinating palace during his rule. The architecture of the City Palace simply reflects the fine architecture of ancient India. The City Palace has attracted many tourists throughout the entire globe. Jantar Mantar : Jantar Mantar was a magnificent astronomical observatory that was built by Sawai Jai Singh. Jantar Mantar was built between 1728 and 1734. Jantar Mantar is a grand astronomical instrumental place to observe time. Major instruments that you can watch moving clockwise are: Small Samrat, Dhruva, Narivalya, The Observer's Seat, Small Kranti, Raj Unnathamsa, Disha, Dakshina & Large Samrat. Nahargarh : Nahargarh is a splendid fort located in Jaipur. Nahargarh Fort is among one of the three forts built by Maharahja Jai Sawai Singh. He was the ruler of Jaipur. Some parts of the forts were ruined with the going time. But still it provides an attraction in terms of stunning views of ancient monumental legacies of India. The fort glitters under moonlight in the night. Central Museum : The Central Museum in fascinating museum in Jaipur. This museum is popularly known as Albert Hall in the early times. This museum was built under the supervision of Lt. Swinton Jacob in the year 1876. The central Museum is located in Ramniwas Gardens. Here in this museum you can find Indo-Sarcenic style of architecture. The Central Museum has many courtyards, pillars and arches. Amber Fort : The Amber Fort is located 11 km north to Jaipur. This fort had been the capital of Kachchwaha Rajputs. Later, Sawai Jai Singh changed the capital to Jaipur. The Amber fort was one of the popular sights of attraction in Jaipur, where the tourists can enjoy elephant rides from the bottom of the Amber fort to the hilltop. By standing in the hill top the tourist can see the excellent views of Maota Lake. Some of the fascinating sightseeing inside the fort includes Raj Mahal, Suraj Pol, Diwan-I-Aam, Ganesh Pol, Jai Mandir, Sohag Mandir, Singh Pol, Shila Mata temple, and Palace of Man Singh. Jaipur is a city of vibrant colors and markets (bazaars) of Jaipur verify this fact. Jaipur's colorful markets offer a great break to stop and shop on you tour. Usually tourists include shopping and visiting the lively markets of Jaipur in their itinerary. While moving through the markets, you will come across the vivacious culture of this region. Jaipur is the perfect place to shop for Handicrafts, antiques, jewelry, gems, pottery, carpets, textiles, metalwork and leatherware. In Jaipur, there are many markets to present you the art and craft of Rajasthan. Kishanpol Bazar, Haldiyon Ka Rasta, Mahiharon Ka Rasta, M.I. Road, Jauhari Bazar, Bapu Bazar, Nehru Bazaar are the main markets of Jaipur. One cannot define in words, the assortment of products, which these markets offer. You have to visit the city to experience the actual range of stuff. Shopping is an electrifying activity in Jaipur. If you don't visit these markets of Jaipur, you will be definitely at amiss. Without a shopping spree in Jaipur's markets, no trip to Jaipur is complete. In this section, we will tell you about the shopping attractions of Jaipur. Jaipur, Rajasthan (India) can be called a wonder destination because this city is full of wonders. There are has been another addition to these wonders and that is the cuisine of Jaipur. One of the best things you will discover when you are eating out in Jaipur is the cuisine of Jaipur. Eating out in Jaipur is an experience of its kind as you get to taste the real delicacies of Jaipur. There is no dearth of restaurants in Jaipur as it is a well developed city and the people of Jaipur are fond of good food. However, it can be pointed out that when eating out in Jaipur it is a good idea to check out the Jaipur restaurants which specialize in Rajasthani cuisines. This is because that is one of the best things about the city and cuisine of Rajasthan which is famed all over the world can be tasted the best in their land of origin in the most authentic taste. Some of the best restaurants of the city which specialize in the Rajasthani foods are Handi Restaurant, Chokhi Dhani, Gulab Mahal - Jaimahal Palace, Suvarna Mahal - Rambagh Palace, Jaipur Darbar and Surabhi Restaurant. The restaurants offer quality Rajasthani cuisines. While some of the restaurants are located in the luxury hotels of the town, most of them are also located in different parts of the city. Eating out in Jaipur is a beautiful experience as the warm hospitality and the traditional settings and royal welcome in some of these Rajasthani restaurants will make your dining really special. However, if you have tasted enough of these Rajasthani delicacies and want to try a different platter then there are a plenty of restaurants to please your taste buds. Amusement Parks Wonderland and Fun Kingdom (telephone: 91-141-397505, 395432 ) are outdoor parks where the kids can have all the fun they want. It's a huge hit with kids of all ages! For more information on Wonderland, you can ring : 91-141-60954. Pink Pearl Water theme Park, on the Ajmer Road. (Telephone: 91-141-370670, 381988). Jaipur ZooHouses a rarely found white peacock and a white lion amongst lots of other birds and four legged creatures. A must visit only for these species. For the hip and trendy teenager, a trip to the Megabowl is a must. It is one of the largest indoor amusement centre at Malviya Nagar that has the latest computer/video games and a bowling alley.